Junior Garrett Sams attempts a free throw. 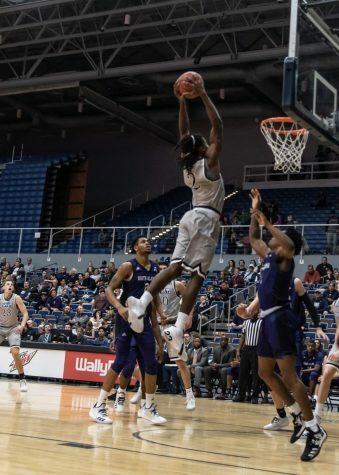 Junior Wajid Aminu scored 25 points including a trio of three-pointers and Junior Noah Horchler added 22 but the effort fell short for the Ospreys in a road game against the Florida Gulf Coast University Eagles, 88-80. 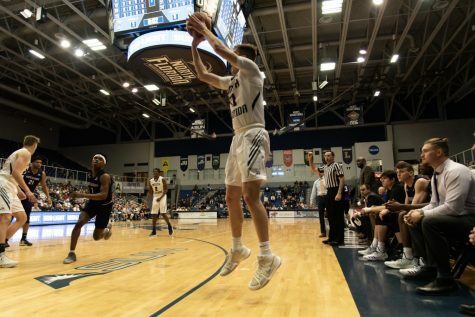 The Eagles opened the game with a 12-4 run before the Ospreys began to warm up and bring the game closer. After seven minutes, FGCU led 16-12 but UNF was working its way back into the game. 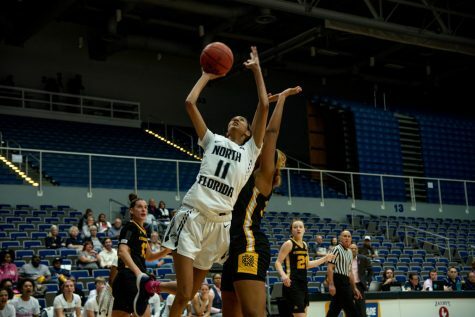 With three early three-pointers, UNF took the lead, 17-16. FGCU immediately responded, taking a 20-17 lead and the score teetered for the rest of the half. Aminu set the tone for his strong game, scoring eight points within the first ten minutes of the game, getting points down low with jump hooks and showing strength on the low block. Horchler, the season leading scorer, put up 15 first half points with a complete offensive showing, knocking down threes and scoring down low. Junior Garrett Sams contributed with eight first half points but was saddled by three fouls. Redshirt-Senior Schadrac Casimir scored 19 first half points, including four from beyond the arc, to pace his unit in the back and forth game. 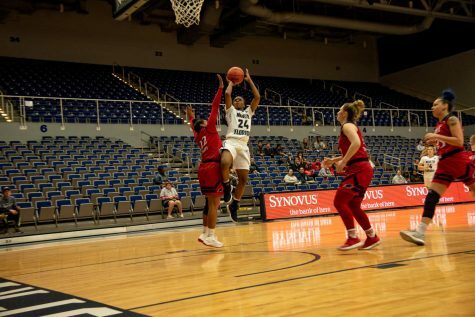 Aminu had 13 points at the break as the Ospreys led 45-44.UNF shot well at that point, making 16-31 field goals, and 7-14 threes. Out of the break, the Eagles went on a 7-0 run. Casimir had four of those points and the run was punctuated by a thunderous one-handed dunk by Redshirt-Sophomore Troy Baxter, Jr. 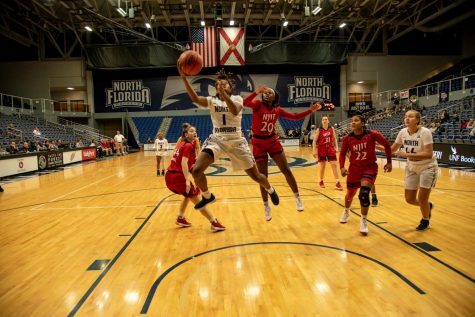 Junior Ivan Gandia-Rosa scored on a three-pointer to open the second half scoring for UNF. From there, they blitzed their opponent by going on a 17-4 scoring run, at one point getting ten straight points without an Eagle response. By then, Aminu had scored 20 in the game including two three-pointers (he had only made six all season entering the game). 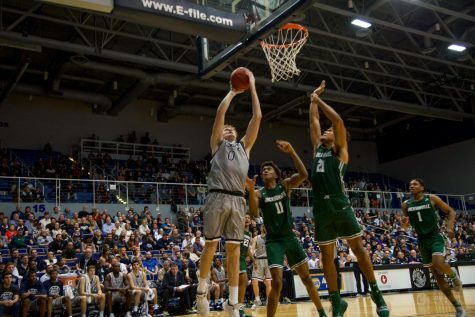 At the 6:20 mark, the Eagles finally took the lead in the game on a corner three-pointer from Freshman Caleb Catto. That shot would begin the downturn of the game for the Ospreys. 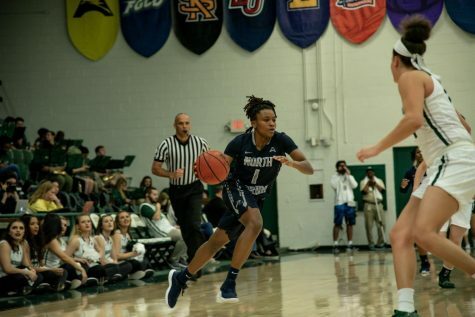 With 3:49 remaining in the game, the Eagles led by two, and would not relinquish the lead from that point on. Redshirt-Junior JT Escobar scored his first basket of the game on a three-pointer to bring the score within four points, but it wasn’t enough. 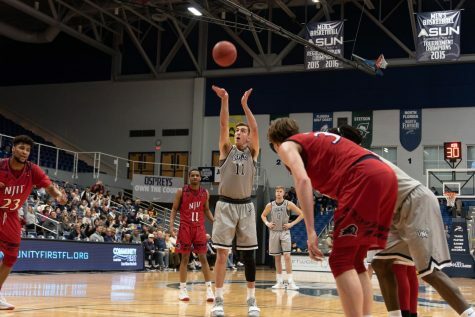 The Eagles made their free throws in the final minute to seal the 88-80 win in another game displaying the Ospreys’ inability to finish after another strong overall performance. 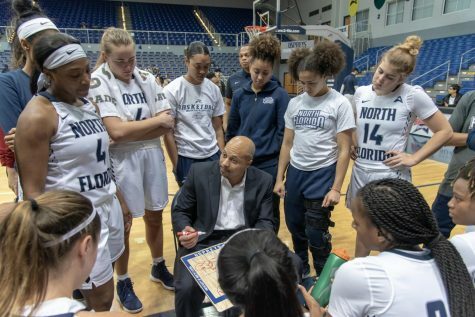 Horchler scored 22, Aminu added 25 and UNF had made 12 threes on the day, but they could not battle back from the deficit. Casimir finished with 33 points on the night to offset the production by Horchler and Aminu and secured the win for his team. 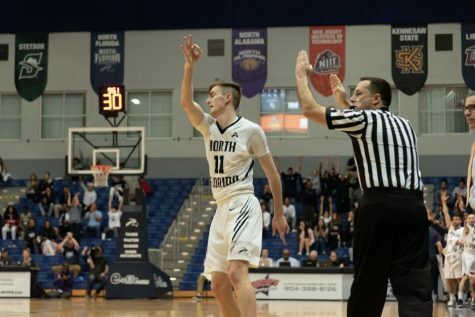 The loss drops UNF to 9-14 (3-5 ASUN) and FGCU improves to 8-14 (3-4 ASUN) with the win. 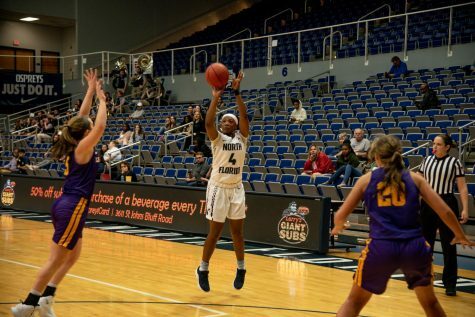 The Ospreys prepare for another ASUN conference road game at Kennesaw State on Wednesday, Jan. 30 at 7 p.m.